Exploring the Empire State – Neales…on wheels! Even though I grew up on Long Island, I haven’t spent much time in the vast expanse of Upstate New York. 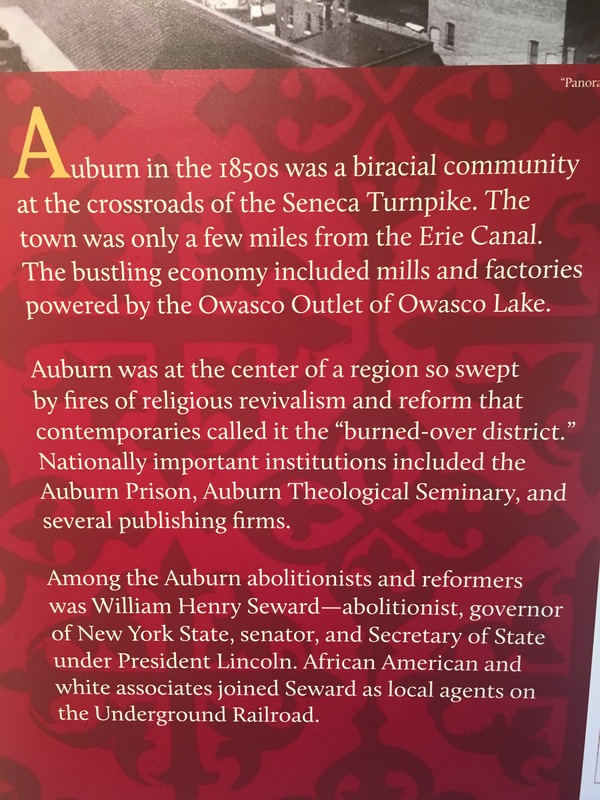 I’m familiar with many of the names – Plattsburg, Oswego, Oneonta, Geneseo, Cortland, etc – not from knowing anything about the towns themselves but from their associated SUNY (State University of New York) schools that many of my high school peers attended. 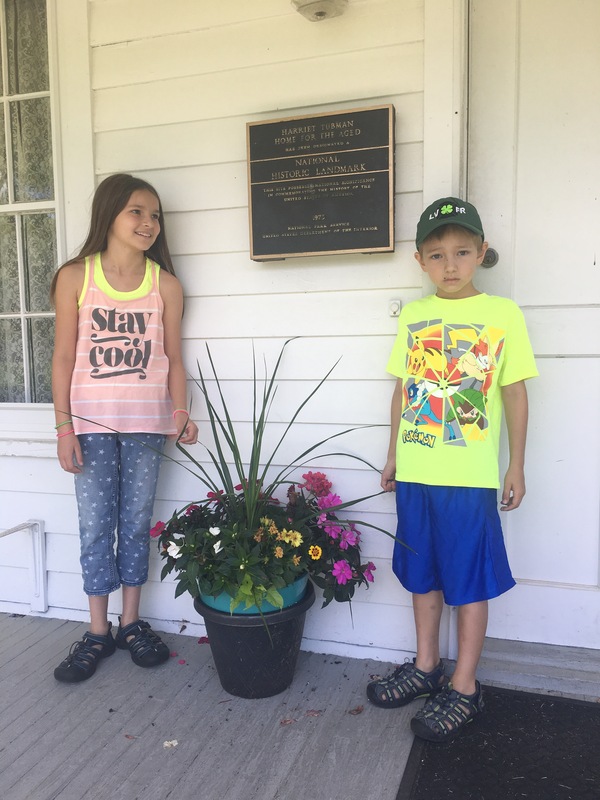 I enjoyed exploring new-to-me parts of my home state with Chris and the kids, even if the bugs and spotty cell service drove us a little nuts at times. Our next stop after Byron was Waterloo Harbor Campground on the Seneca River in the Finger Lakes region. We had to call around a bit to find a place available over the weekend but lucked out with a nice campground at a good price. We would have stayed longer if the cell service or wifi worked. But we got the most out of our visit: our campsite was next to a big grassy area where we could let the dogs off leash, there was a great family staying next to us, and we got to explore some of this beautiful and deeply historical area. 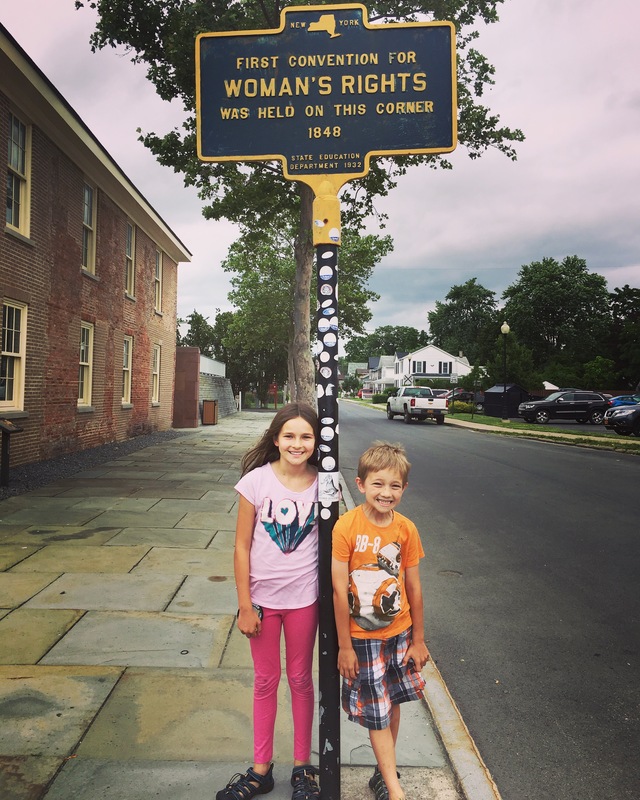 The Women’s Rights movement intersected with the Abolitionist movement and the Underground Railroad in upstate New York. 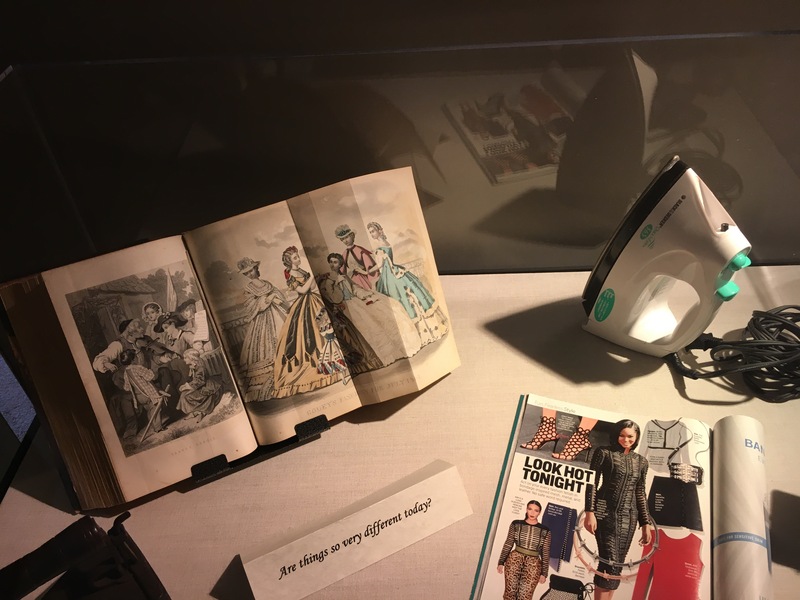 In fact Elizabeth Cady Stanton and Lucretia Mott met at the 1840 World Anti-slavery Convention in London – where women were barred from the convention floor. 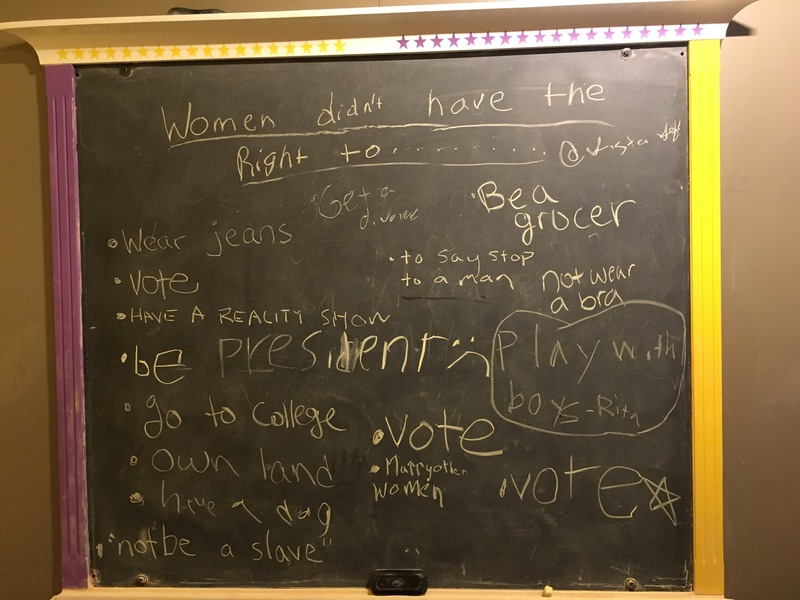 Frederick Douglass attended the Women’s Rights Convention, and argued the case for the right to vote, one of 12 resolutions in the Declaration of Sentiments and Grievances written by Stanton. The escaped slave, Underground Railroad conductor, Civil War spy, and all-around badass Harriet Tubman spent the last decades of her life in Auburn, NY. She established a Home for the Aged for African Americans, and was cared for and died there herself in 1913 at the age of 92 or 93. 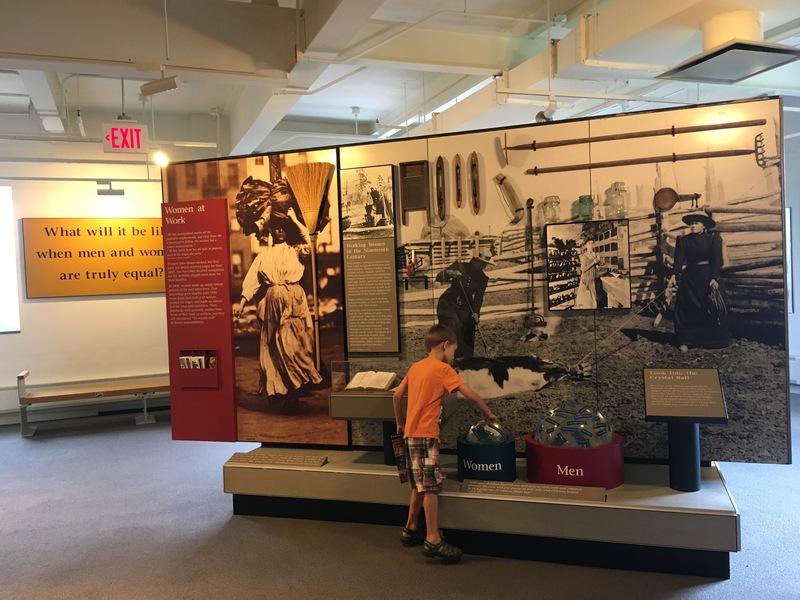 The Home for the Aged is one of three sites that make up the Harriet Tubman National Historical Park. 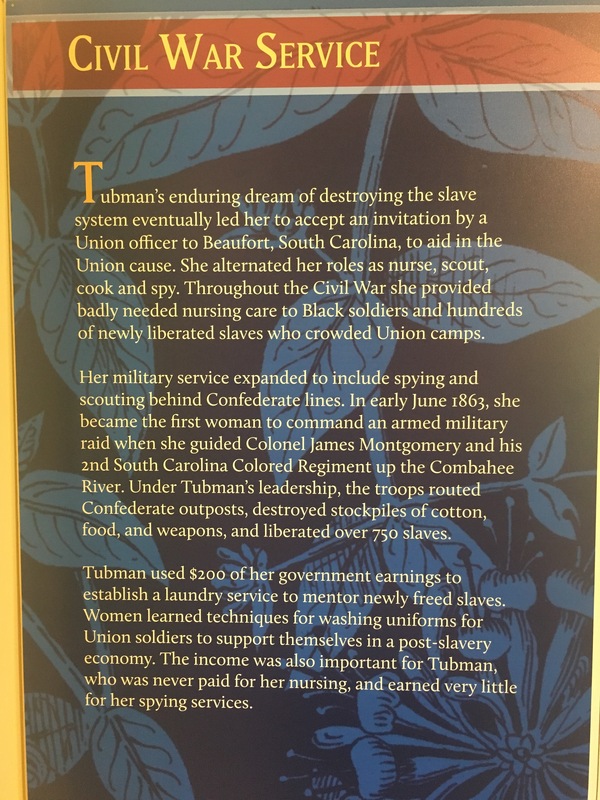 Reading about Harriet Tubman left a big impression on me as a kid, and it was very meaningful to see her final home and learn more about this incredible woman in the visitor center. For my birthday we took a scenic drive to Cayuga Ridge Estate Winery for lunch on the patio with a view out over the vineyard and Lake Cayuga. On the drive back through pretty farmlands we saw horse-drawn buggies and experienced our first Mennonite grocery store, which was awesome. Lots of fresh produce, baked goods, and meats, all at great prices. Plus, a dizzying selection of bulk spices and baking products… clearly catering to customers who cook from scratch exclusively and/or for large groups of people. Back at the campground we had fun hanging out with the neighbors, whose kids gave ours some basic fishing lessons (they didn’t last long after the “be quiet and stay still” part). Cayuga Ridge Estate Winery, with Cayuga Lake in the background. Wood-fired pizza lunch with a view. Sauder’s grocery store baking aisle. That’s just one side. Charlie and Muddy, his briefly beloved frog. We had to find a place to stay for a few nights before our reservation over the 4th of July weekend near The Thousand Islands. We thought we found a place in Oswego on Lake Ontario that had Verizon service, but they didn’t allow pit bulls. When I called a place in Pulaski I was told that the owners of the campground have Verizon and it works well – but when we got there we found that there was no service at the lower level campsites. And, their wifi was down. We took a drive to check out the cell service near a couple other campgrounds for ourselves. Our last stop was an RV park whose owner told us over the phone that cell service wasn’t good, but they have wifi. From experience we’re skeptical about campground wifi, but we didn’t have many other options. So we stopped by, and our new best friend Sal came out to greet us. He immediately gave us the wifi password so we could test the speed. He brought us into the lounge to show us where the kids could play and watch tv, and talked internet devices and speed with Chris. He had already picked a spot for us next to the office for the best service, and offered to let us check in right away at no charge so we didn’t have to move during the rain expected the next day. Our nice spot at Bear’s Sleepy Hollow Campground. The lower portion of the campground next to the overflowing Grindstone Creek off Lake Ontario. The first campground was understanding about our reason for cancelling, so without issue we packed back up and drove over to settle in for an enjoyable few days at Bear’s Sleepy Hollow Campground, despite some rain. While Chris was working I took the kids to the welcoming storefront library on Main Street in the town of Mexico. 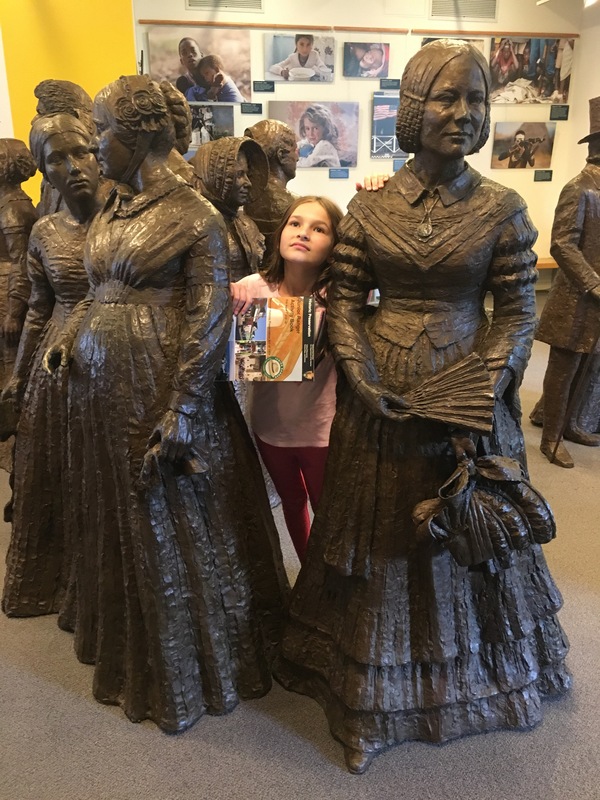 We all drove into Oswego for lunch and errands, and found a charming town on Lake Ontario with really interesting history, from the 18th century Forts Oswego and Ontario, to Abolitionists and Underground Railroad activists. Salmon River Falls were a short drive away. The 110-foot falls were beautiful, but the highlight was walking around the rocks and shallow pools right above the falls. Our campground was next to Selkirk Shores State Park on Lake Ontario which had some beautiful old cabins and lodges. Much of the camp grounds and buildings were constructed by the Civilian Conservation Corps during the Great Depression. I enjoyed a few solo bike rides around the park, an activity I missed from when we lived in our house. One of the lodges at Selkirk Shores. I can’t move on before mentioning Sal again. One time he stopped by to ask when it would be a convenient time for him to restart his wifi router, knowing that Chris was working. When we mentioned that we would be in Connecticut in a couple weeks, he not only checked availability and printed out information about his own campground in the state, but also gave us details about a couple other places he personally recommended based on their wifi or amenities for the kids. Sal was the best! Pretty Grindstone Creek at Bear’s Sleepy Hollow Campground. I started hearing about record flooding on Lake Ontario this year, and that an agreement between the US and Canada to regulate the flow of water on the lake had as much of a detrimental effect as heavy rainfall and snow melt. Here are a couple articles about the controversy; I don’t know enough about it, but we did see some dramatic effects of the flooding. The lower level of Bear’s Sleepy Hollow after rain. A hotel in Alexandria Bay, at The Thousand Islands. The 1000 Islands / Association Island KOA we booked for four days over the 4th of July was located on Association island in Lake Ontario, connected to the mainland by a narrow causeway. After seeing some of the flooding first hand, I felt a little nervous being out there with the water lapping right up at the edges of the fully booked campground, not to mention our site, especially when the rain and wind picked up over night. (Interesting aside: the island was previously a GE corporate retreat, a YMCA, and training camp for the US Olympic sailing team.) But we were safe, and the kids loved it: the game room; the cool recumbent bikes available to borrow; decorating their own bikes and riding in a kids parade for the 4th. We watched fireworks across the bay, although the Rita and Charlie were more enchanted by the lightning bugs nearby. The causeway to our campground island. We lucked out getting this spot on a holiday weekend. They were thrilled with these arcade games that didn’t need quarters. Rita also loved this giant chessboard in the game room. We did manage to get off our campground island a couple times: to take a hike nearby, get a view of the beautiful Thousand Islands from the main tourist town of Alexandria Bay, and to meet up with a friend and her family for lunch and a walk around the charming and historical town of Sackets Harbor. The brunch at Tin Pan Galley in Sackets Harbor was worth the wait, and the kids found this cannon more entertaining than the playground. The Thousand Islands at Alexandria Bay. A hike in Robert Wehle State Park near our campground. Sunset on Lake Ontario from our campsite. Next up: the wild beauty and relentless flying pests in the Adirondacks, followed by blissful Lake Champlain. How very nice to see you in a photo! Happy Belated Birthday. We have good friends who live in Palmyra, N.Y. – so very close to where you were. Your photos make me really want to go there. We stayed in upstate N.Y. years and years ago and loved it.